Taking a stroll in the ruins of Pompeii was… I don’t know… using a little bit of imagination, it felt kind of like taking a time travel about 2000 years back in time. We walked the streets, checked out local brothels and bakeries and enjoyed the sun shine on marble stones embedded in the streets. The bright white stones also reflect the moonlight, making it easy to follow the main roads in night-time. It must still be a beautiful sight, like watching the reflection of a sparkly night sky. 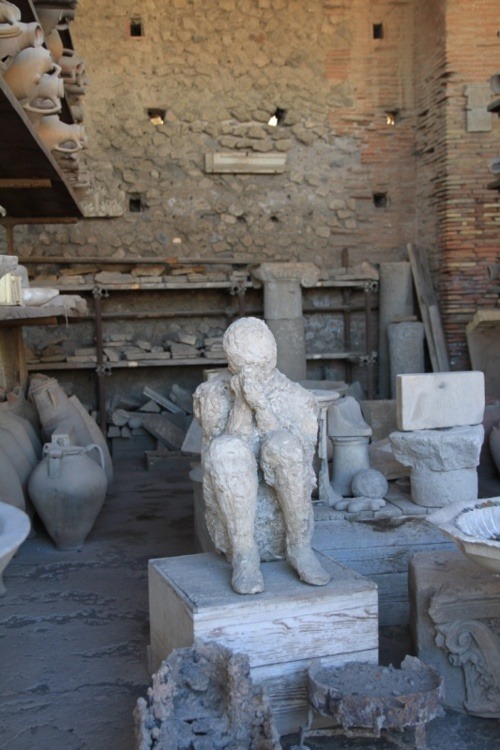 After the eruption of a volcano close by the Vesuvius (Vesuvius was evidently formed during this eruption), the city of Pompeii was completely covered by volcanic stone and ashes. Along with the buildings, about 2000 of the 20-30 000 people residing there, cats, dogs and other animals were buried alive. They all had roughly three days to get out, but for some reason they didn’t. The cavities and the bones left after the decay of the bodies were so well preserved, that complete plaster casts were made at the discovery. Seeing the shape of humans, like 2000 year old echoes of their dying moments, made a profound impression somewhere in me.